90% of the structural concrete is already poured into place. 3,300 workers have delivered over 3,200,000 workhours already (no serious accident reported and Qatari hosts assure safety is paramount). 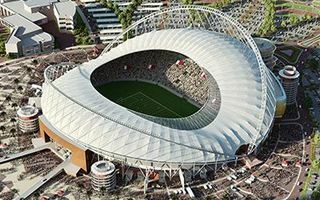 The stadium will be ready in late 2016, becoming the 2022 World Cup’s first stadium to open its doors. Khalifa International Stadium doesn’t resemble the stadium we used to be impressed by in previous years. All roof is now dismantled as a new large tent (covering 70% of the arena) is about to come. The key part of this project goes on in the east side of the stadium, where (among various other uses) a new sports museum will be created. After the delivery of concrete works, progress is expected on the roof. Previously supported by a large arch, now it will be held in place by two, even larger. The roof will be a very “international” feature. The membrane fabric is ordered in the United States, will be assembled in Mexico and cables supporting it are made in Germany. Khalifa Stadium is crucial to Qatar’s 2022 tournament, expected to host group games, quarterfinal, semifinal and perhaps even more games, depending on final stadium list.